UC Health is a proud sponsor of the Center for Closing the Health Gap’s annual Health Expo. The Saturday, April 28, at Washington Park event brings healthcare access directly to the Cincinnati community. 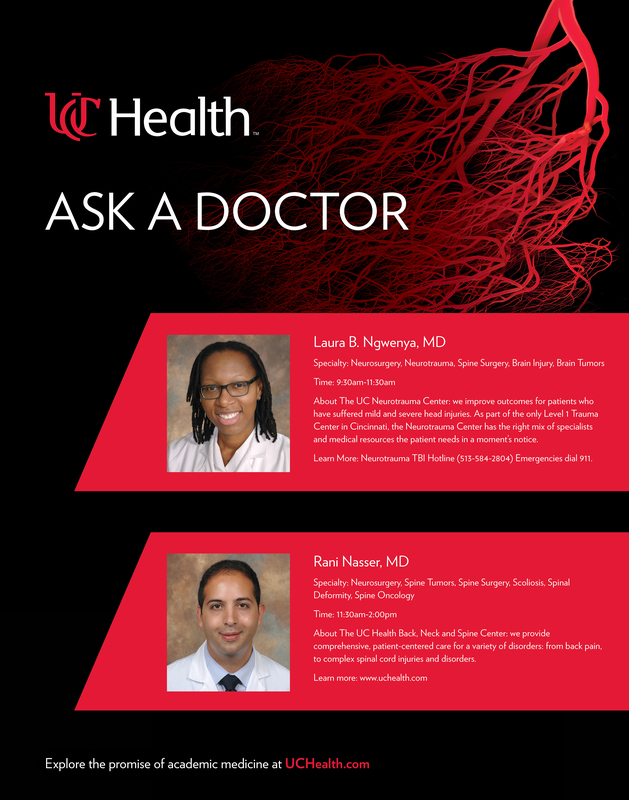 Visit a UC Health physician during one of two “Ask a Doctor” sessions during the Expo. Fall Risk Screening (TUG Test)—a timed “up and go” test of mobility. Offered from 10 a.m. to 4 p.m.
Prostate Screenings—Digital Rectal Exam (DRE) and Prostate Specific Antigen (PSA) tests offered via mobile screening van. Offered from 11 a.m. to 4 p.m.
Throat and Neck Cancer Screenings—check of the mouth, throat and teeth for masses or nodules. Offered from 10 to 11:30 a.m. Lung Cancer Screening—Screens to determine eligibility for Lung Cancer Screening Program evaluation. Offered from 10 a.m. to 4 p.m. Blood Pressure Screenings. Offered from 10 a.m. to 4 p.m.
Waist Circumference Screenings. Offered from 10 a.m. to 4 p.m.
UC Health representatives will also offer information about safe sleep practices as well as trauma prevention, including Stop the Bleed courses, fall prevention, and distracted driving. What Should You Know About the Health Expo? Hosted by the Health Gap, the Health Expo is an event focused on bringing health care access to the Cincinnati community – gaining awareness and establishing good health habits for the entire family. Attendees of the event will have access to free health screenings, fitness as well as local and national entertainment. Learn more about the Health Expo.